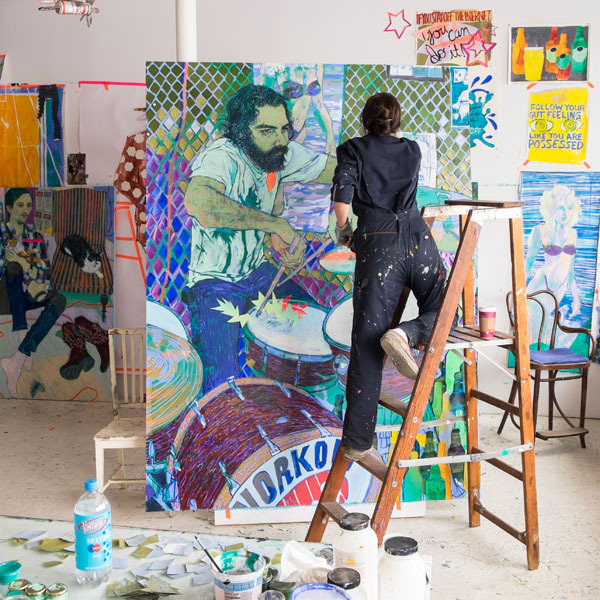 Hope Gangloff works on a portrait (Courtesy of Vogue). Hope Gangloff’s work stands out amongst traditional pieces of art and has progressively altered familiar museum spaces in order to incite engagement with new and present day artistic ideas. The New York City native and self-proclaimed “ham-fisted writer and a casual jerk” is primarily known for creating vivid and animated oil portraits of her friends in order to capture her perspective on the culture of American life. Gangloff’s study of art began at Cooper Union in New York and has since bloomed internationally and nationally through her work with several publications including Spin Magazine and The New York Times. Gangloff has also exhibited her work with solo shows in galleries and renowned museums around the world and the country from Michigan to Rome. She has also participated in group exhibitions — one of which she worked alongside Nadar Mahar, named UK’s 50 most significant contemporary photographers in Portfolio Magazine. Her depictions of everyday life and her choice to only paint familiar figures highlight the connection between her as an artist and her friends as the subjects. Calling her subjects the “right people,” she stated in an interview that she picks the same subjects “over and over again, because then it feels like another hangout.” She also focuses primarily on pattern, lines and the human form, and she always hopes to reveal her friend’s personalities by focusing on her connection with them while painting. While visiting some of her paintings this past Thursday, I noticed her subjects were each displayed very differently, from a man laying across a lawn to a woman writing in a busy office. The Bohemian theme, which was very inspired by her city life, lavishly came together with the bright and almost neon paint of her large pieces of work. Her meticulous attention to detail accentuates her unique attention to human nature. Gangloff ‘s paintings are now ongoing here at Stanford’s Cantor Art Center. Her exhibition at the Cantor — “Hope Gangloff Curates Portraiture” — will be available to view up until April of next year as she prepares to paint one of the center’s team members — the executive assistant to the director, Tammy Fortin. The museum announced early this year that the portraist and painter accepted the invitation to be the first Diekman Contemporary Commissions Program artist. Alison Grass, Associate Director for Collections, Exhibitions and Curatorial Affairs expressed the fact that this program “allows contemporary artists to use the Cantor Arts Center as a laboratory of sorts as they respond to the architectural space and create new and unexpected works.” The launching presentation of the “Artists at Work 2017” program featured several of her vibrant portraits to be hung across Atrium Balcony. Her role as curator will allow her to emphasize the importance of collaboration between new artistic perspectives and old perspectives for the sake of initiating dialogue among the public. She also wishes to combine some of the museums historical pieces with her own contemporary art in order to engage the audience of the exhibition with sharp, contrasting perspectives. Students and others will have the opportunity to witness the creation of her art in person as Gangloff painted live in the Atrium late May. As Gangloff is often very private with her public appearances and her discussion with the media, this was a special chance to connect with her work on a different level. Her paintings set the stage for a new wave of contemporary art — one of bold and rich displays of color and enchanting expression of emotion and spirit. “Hope Gangloff Curates Portraiture” is available to view for free Wednesdays through Mondays 11 a.m. to 5 p.m. and Thursdays until 8 p.m. at the Cantor Art Center. Contact Shannen Torres at shannent ‘at’ stanford.edu.